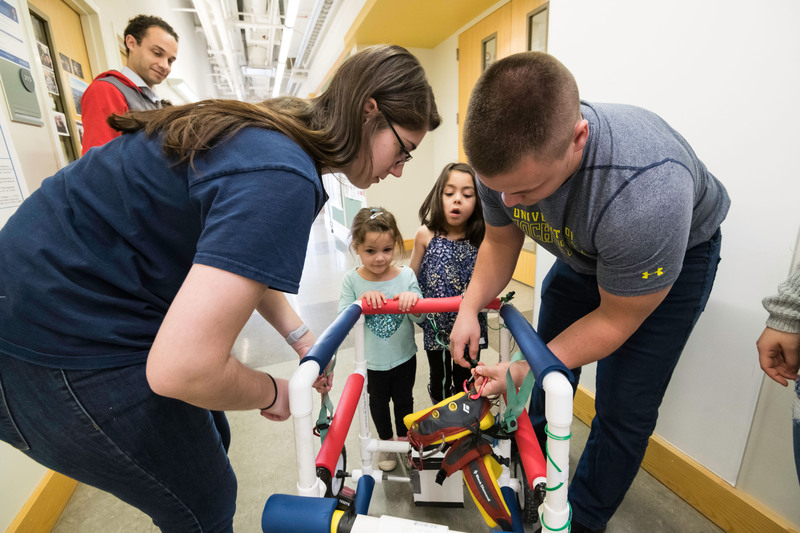 The Biomedical Engineering Senior Design program introduces students to a systematic, customer-driven design and problem-solving approach to developing prototypes of medical devices and research instruments. The program includes a two-semester sequence of courses that starts with students benchmarking and analyzing existing medical devices. They then break into teams to solve a problem posed by Rochester faculty members, clinicians from our medical center, the local community, or local industry during the remainder of the year. Student teams are supervised by biomedical engineering faculty, who provide both technical and project management guidance. Seniors work directly with the graduate students in our CMTI program who have spent weeks observing unmet needs in the clinical environment. If you are interested in design, but are looking for an MS program, consider the graduate program within the Center for Medical Technology & Innovation offered through the Department of Biomedical Engineering. In solving these problems, students generate a formal design proposal, participate in formal design reviews, develop physical prototypes, and test their devices. They also provide extensive reports to document the results of testing and considerations for further implementation. Following several guest lectures throughout the year, all design teams are expected to thoroughly consider many realistic constraints, including ethical, economic, manufacturing, social, and regulatory issues. Over the last 15 years, our students have completed more than 200 projects, including clinical devices, assistive technology, biomedical research instruments and protocols. In 2013 MonoMano Cycling became the first student-founded corporation based on a senior design project. Several teams have entered projects in local entrepreneurship and national design competitions with great success. Other teams have worked with UR Ventures to disclose their inventions and consider patent applications. Senior design project teams have had winning entries in national design competitions, the NY State Business Plan Competition, the Mark Ain Business Plan Competition, as well as a 10-year track record of success at the Forbes Engineering Entrepreneurship Competition.